“Calling it a North American first” begins an article about the latest discriminatory legal move against Muslim women. Where in North America might a discriminatory “first” have taken place? Not in some Deep South red state, or actually anywhere in Trump’s America. No, this one is home-grown. Welcome to Quebec, the Canadian province that has been escalating its battle against the public practice of Islam over the past decade. Philippe Couillard, Quebec’s premier, did the far right proud back in July when he went out in public to say “Unfortunately, you cannot disconnect this type of event — terrorism — from Islam in general.” That’s right, practitioners of a major global religion, you’re all inextricably tied to terrorism in the eyes of Quebec’s leader. 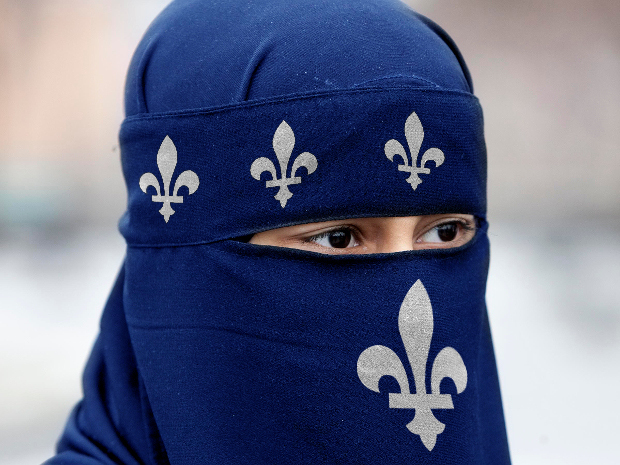 There’s a bit of Catholic nativism at work in Quebec, to be sure: back in 2013, the Parti Quebecois proposed a revision to the provincial Charter which disallowed government employees from wearing “any overt symbol” of religion, explicitly including kippahs (Orthodox Judaism), burkas, hijabs (Muslim women), turbans (sorry Sikhs, that’s you too) and “large” crosses. Why that qualifier? Well, that would be so that small crosses would still be allowable. Presumably if you had a teeny tiny turban that would be cool too, just so long as no member of the public knows that you’re expressing your religious conviction by wearing it. We also had the fairly unnecessary ruling back in 2010 that Muslim women were not required to receive the “reasonable accommodation” of being seen by female doctors at their request. Nevermind that other groups, including Orthodox Jews, made similar requests – and were similarly dismissed. Battles over “reasonable accommodation” in Quebec have been the norm since 2007 and arguably before, though 2007 marked the founding of the Consultation Commission on Accommodation Practices Related to Cultural Differences. It’s where minorities can speak to the accommodations that would make it possible to live in equality with others while upholding the tenets of their personal faith – and where a 75% Catholic polity can oppose such accommodations at every turn, arguing against the expense of accommodations, against the perceived sexism involved in demurring from government services provided by the opposite gender, and against the perceived threat to Quebec posed by persons who want to change the rules to continue to hide something about themselves. That’s the surface level of the arguments, at least. Remember that proposal I mentioned from 2013? Well, it’s coming into force now. It restricts facial coverings for anyone “providing or receiving” any government service, which also includes buses. Wearing a niqab? You get to walk. What else constitutes a government service? Health care, of course – “please take off your burka, I need to examine your sprained ankle.” School. Arguably if you call the police to your home to report a burglary, they are required to ask you to uncover your face before they can take a statement. And this is Quebec’s Liberal Party at work. All other parties voted against this, though perversely enough the Parti Quebecois (the originators of this discriminatory policy) and Coalition Avenir opposed it on the grounds that it doesn’t go far enough. That’s because this version doesn’t target down symbols of any non-Christian religion – it pursues only face-covering garments. Let’s be fair, here: I’m not very comfortable with the burka or niqab as cultural institutions; I find it hard not to look at them as examples of a male-dominated society imposing rules on women for the sake of maintaining male dominance. That’s a product of seeing the worst and most extreme versions of such beliefs at work, and of understanding that related practices still lurk in the shadows of Canadian society even as many young Muslims look to a bright future in which they pursue their beliefs in a modern society and in a manner they define and manage. Whatever my personal views on the origins of this religious practice, however, the simple fact remains that I am not a Muslim woman. I should not make decisions for others on the individual level on the basis that I have the complete snapshot of what the burka or the niqab mean. In the past, Quebec’s legislators have pursued the line that these garments represent “oppression” and that forcing women to go without is a form of freedom. In reality, of course, they’re saying “if you choose to follow your religion as you believe it, you will be officially and legally treated as a second class citizen.” Coercion is not liberation. Education and opportunity are the tools of liberators. Respect and understanding are the tools of liberators. The new argument, advanced by Couillard of the “Islam is inseparable from terrorism” position, is that equality means everyone sees each other’s faces. For some Muslim women in Quebec, this will mean a choice between practicing their faith as they believe it and participating in Canadian society. For many of these, that’s not a choice at all. Face-covering garments may never sit well with me, but equally I cannot endorse coercive attempts to ask people to discard their faith. Not when I know that the government is openly stratifying society by doing so; not when I know that anti-Muslim discrimination remains endemic in Quebecois society; and not when I know that the originators of this legislation seek to erase all symbols of religious worship except the cross – forgetting what it stands for in the process.